“If you can come with no shoes on, come on in. If we can find some shoes, we’ll give them to you” — Henrietta Smith. — My latest InterFaith21 spotlight in The Coastal Star. It’s hard to imagine more welcoming folks than at the Church of the Palms, the North Swinton Avenue congregation celebrating its 50th year in Delray Beach. The Church of the Palms was commissioned in January 1961 by the state conference that preceded the United Church of Christ. Even then the fellowship was helping to lead the way. “These women were meeting together before that time,” Smith said. In fact, the Women’s Fellowship hosted its first communion two months earlier, in November 1960. “They were meeting in the Delray Beach Playhouse, quietly doing their missions from there from day one,” Smith said. This November, the women again served communion. And then refreshments during the reception following the worship service. They also commemorated during their annual Christmas luncheon that first communion service. But that barely hints at the local and international service work Smith recounted. “The whole church is missionary oriented,” she said, “and the Women’s Fellowship does quite a bit in that area” — whether building a fresh water source for young people in Brazil, a church and school in Haiti or similar humanitarian projects in Kenya and elsewhere. The acclaimed Comfort Dolls, representing every culture, also have warmed hearts at the Community Child Care Center and the pediatric ward of Bethesda Memorial Hospital. In yet another ministry, the women make and give prayer shawls to those in need of special support. She arrived from New York in the 1950s with her husband, a retired judge and native Floridian who went to Brooklyn Law School, because as an African-American he was not allowed to go to Stetson University. The Rev. 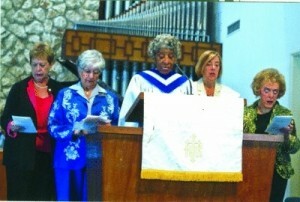 Elizabeth Hill, recently retired from a part-time ministry to older adults at the church, described its “rather dramatic transformation from a ‘country club’ church of primarily retired people, mostly Caucasian, almost no kids, to its present configuration an open, multicultural, diverse congregation open to all people of faith: ‘Wherever you are on the journey you are welcome here.’ We have lots of kids, people of varying cultural and nationality backgrounds, and a very different look and feel than 10 years ago,” the Rev. Hill said. “The church has evolved to be a very strongly diverse congregation,” said the Rev. Roger Richardson, their pastor. He recalled that a couple of years ago, “We had the call to worship, on Pentecost Sunday, in German, Creole, Spanish, Romanian and, of course, English. We have a Creole service on Sunday morning along with the English service, and on Saturday night we have a service that embraces Portuguese, Spanish, Creole and English. “I believe over the years the Church of the Palms has not had as open and welcoming of a reputation as they have now forged,” Richardson said.